Healthcare Culinary Solutions » Healthcare Foodservice: Can We Fix What Ails Us? Healthcare Foodservice: Can We Fix What Ails Us? Hi, I’m Chef Mark Dyball, I have been in the culinary business for over three decades and most of that time has been spent in Healthcare foodservice. For the last three years I have run my own culinary consulting business: Healthcare Culinary Solutions LLC. Previously, I was the Executive Chef at UCLA Medical Center in Los Angeles for eleven years. In this blog, I plan to regularly share my opinion and provide solutions to common healthcare foodservice issues. Fair warning: at times, I may come across as bold, even harsh. This is because I feel deeply passionate about the industry and believe it is time to shake off the cobwebs and bring ourselves into the 21st century. So here goes: just what does ail healthcare foodservice? The running joke in the culinary business is that, of all foodservice sectors, hospital food always clocks in with the worst reputation. Just ask anyone on the street their opinion of hospital food: guaranteed it will be pretty negative. Is this a justified opinion? Well, I’d have to say, yes, it certainly can be worst. At social events, when I tell people what I do, the conversation usually ends right there. But I’m not in this business to impress people at dinner parties; I’m here to help hospitals across the nation break out of that sad box–and some already do, occasionally. Just unfortunately, still too few and far between. Fundamentally, most foodservice departments are stuck in the past: old leadership strategies, food that belongs to a 1970’s school cafeteria, no service standards, a work force that does not want to be there. What we have here is a chronic lack of vision within foodservice departments across the nation. But why–given the public’s new and well-documented obsession with high-quality, healthy food–do so many hospitals continue to flat-out reject needed change? One reason stems from a widespread attitude of obligation among executive leaders towards their hospitals’ auxiliary services. These leaders view their auxiliary services (foodservice, EVS, parking, etc) as a necessary, if inglorious burden. We have to feed the patients and staff, we have to clean the patient rooms. This attitude seeps down to the auxiliary units like the nutrition department. How can nutrition service workers take pride in their work when their leaders clearly do not? Here’s a thought: When was the last time you witnessed a hospital CEO interact with foodservice department employees, take interest in the department’s organizational structure, or even taken a look at the financial books?I’m guessing never; foodservice departments are located in the figurative basement–out of sight out of mind. This also sends a message that the work isn’t noble, one which seeps into the department’s leadership structure. The typical leadership strategy within most foodservice departments is to simply get by with what they have, make cuts in staff and services when asked, and generally keep a low profile. It’s called survival. But healthcare is changing, and fast. Visionary hospital foodservice–appealing food, backed by a higher standard of customer service–has been proven to lift patient satisfaction scores, which in turn reaps hospitals huge rewards in the new results-based climate of the Affordable Care Act. It’s now time for those executive leaders to take a fresh look at their long-neglected nutrition departments. There is so much potential here, just waiting to be tapped. To do that, hospital need to be willing to change the departmental business model. Certainly there are some home truths to consider when thinking about starting down this path. I have already mentioned entrenched leadership attitudes, but these in turn give rise to many separate issues: poor departmental communication systems, lack of training strategies, mission and vision statements which are not ingrained into the organization, nonexistent customer service programs, departments that routinely fail to pull their financial weight, a lack of culinary identity and, above all, leadership’s inability to hire and retain a committed, talented workforce. As a chef and culinary consultant who has traveled America for decades implementing healthcare retail and room service programs, it’s become my conclusion that without a solid foodservice organizational foundation, no hospital can hope to address the issues I’ve outlined above. In the past, some of my clients have focused on the end goals rather than organizational culture change. In my experience, this is akin to building your house on sand. 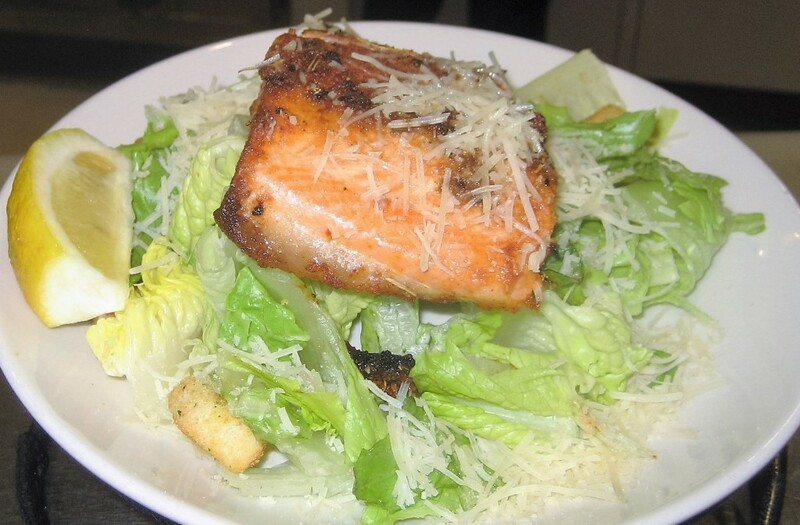 Lackluster blackened salmon on a tired bed of Caesar salad. 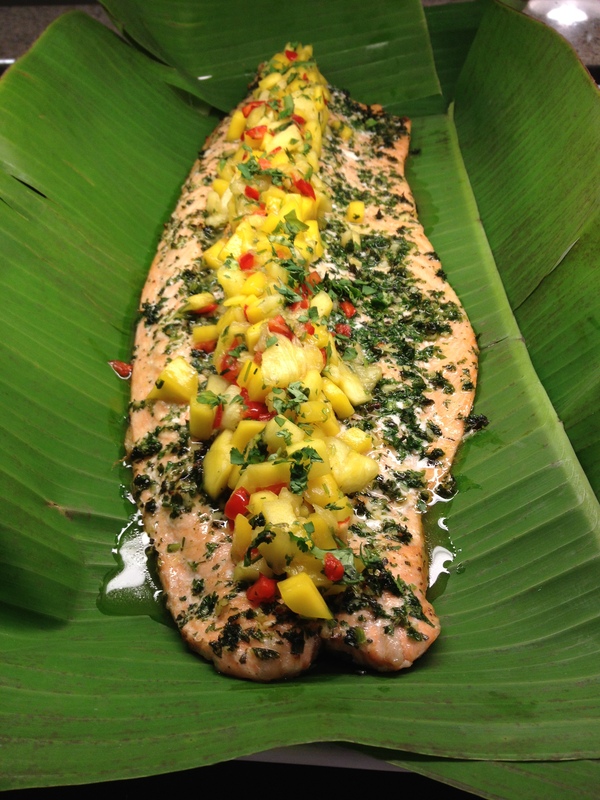 Roasted salmon with tropical pineapple and mango salsa.